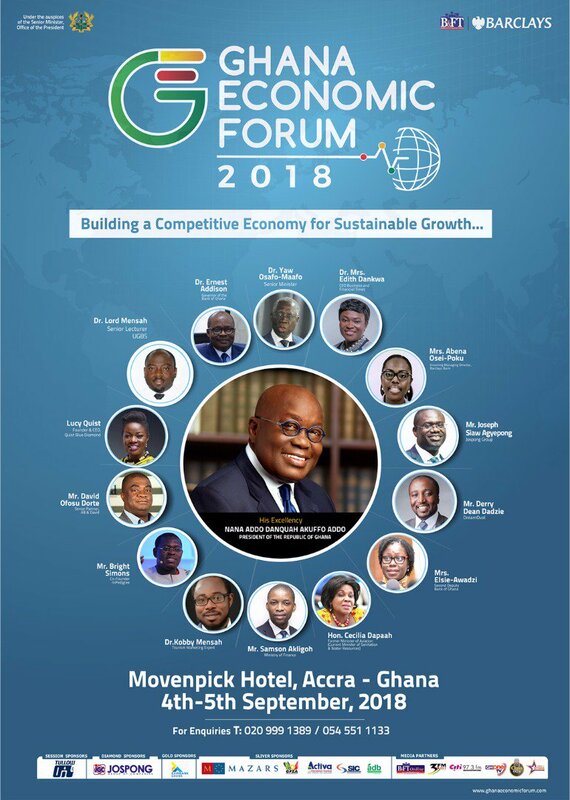 The seventh edition of the Business and Financial Times’ annual event, the Ghana Economic Forum (GEF), is set to open tomorrow at the Mövenpick Ambassador Hotel in Accra. This year’s forum, which will take place from September 4-5, will be held under the theme ‘Building a Competitive Economy for Sustainable Growth’. The two-day meeting will bring together over 500 chief executives, investors and financial decision-makers, and key policymakers to support the development of Ghanaian businesses and facilitate dialogue between the private and public sectors. Last year’s event saw a host of delegates from all sectors of the economy deliberate on issues targeted at ‘Building a Ghanaian-Owned Economy, 60 years after independence’. Indeed, many policy decisions and directives have been made on this platform which have positively impacted on businesses. Business leaders, in addition, have also shaped policy on this same platform. Experts will deliberate on the sub-theme for this year’s event – ‘Building a Competitive Economy for Sustainable Growth’. This comes at a time when the country looks to position itself to be competitive in a growing sub-region. This year’s edition will take a critical look at Finance, Agriculture, Manufacturing, Technology and Fintech, Tourism Agriculture and other areas crucial to development of Ghana’s economy. The Vice-President, Dr. Mahamudu Bawumia, is expected to deliver the opening address. Other expert speakers and panellists include: Mr. Yaw Osafo Maafo, Senior Minister; Dr. Lord Mensah, Senior Lecturer, University of Ghana Business School (UGBS); Mrs. Abena Osei-Poku, Incoming Managing Director, Barclays Bank; Mr. Jeff Gable, Head of Research, Absa Group Ltd.; and Dr. Norah Gyiele, Minister of State for Agriculture. Other speakers include: Dr. Ernest Addison, BoG Governor; Mr. David Ofosu Dorte, AB & David; Sampson Akligoh, Ministry of Finance; Alhassan Andani, MD, Stanbic Bank; George Asante, Head of Trading (Ex SA) Absa Group Ltd.; Kojo Addae-Mensah, Databank; Mr. Solomon Lartey, MD Activa Insurance; Kofi Adda, Aviation Minister; Dr. Kobby Mensah, Tourism Marketing Expert, UGBS; and Prof. Kodzo Gavua, Dean-Department of Art, UG. Mr. Kobla Nyaletey, Director-Head of Markets, Barclays Bank Ghana & Nigeria; Mr. Ebenezer Amankwaa Minkah, CEO, Ekam Capital Ltd.; Ms. Lucy Quist, International Business Leader and CEO of Quist Blue Diamond; and Mr. Joseph Siaw Agyepong, Executive Chairman, Jospong Group, are the other set of speakers expected at the two-day event. Chief Executive Officer of the Business and Financial Times (B&FT) Group, Dr. Mrs. Edith Dankwa, said the Ghana Economic Forum has over the years evolved into an influential platform that brings together businesses, government, the international community and civil society to dialogue and shape the country’s economic agenda. She further added that even though the country has seen some strong economic growth over the last few years, there remains some signs of underdevelopment among the citizenry – citing unemployment as one of the major setbacks. “Despite the strong economic growth realized so far, challenges still abound. Unemployment is arguably one of the biggest challenges we now face as a country. Government and the business community must pursue a common agenda to create jobs for the people,” Dr. Mrs. Dankwa said. The 2018 Ghana Economic Forum is powered by Business & Financial Times Ltd. and Barclays Bank, a member of the Absa Group Ltd. The event is also sponsored by West Blue Consulting; Eximbank Ghana Ltd.; Jospong Group, Tullow Oil, Ghana Free Zones Authority; International Insurance Ghana, SIC, ADB, Firmus Advisory, Mazaars, and Citi FM among others.